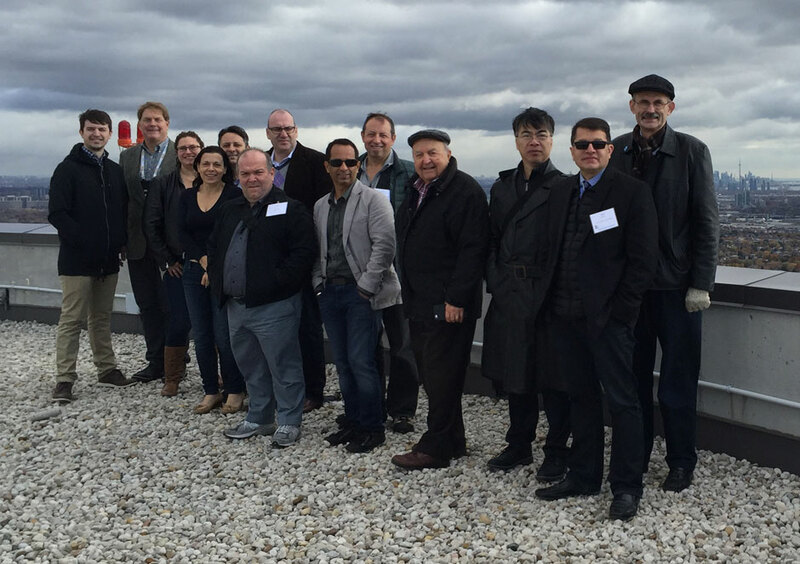 The Toronto Regional Tour – attended by 20 delegates of the CTBUH 2015 New York Conference and organized by Council leaders at CTBUH Canada – began to high acclaim with an informative tour of One Bloor East, a topped out 257-meter residential tower in the Yorkville district. The building tour, hosted by Alan Vihant of Great Gulf Limited and Michael Attard of Hariri Pontarini Architects, took guests to the uppermost floors, which provided stunning views of the surrounding metropolis given the day’s particularly clear conditions. The group also had the pleasure of traversing the tower via KONE JumpLift elevators, which as luck would have it, were being “jumped” on the day of the visit. The hosts emphasized how the tower’s location at the southeast corner of Yonge Street and Bloor Street, one of the most active and prominent intersections in Toronto, called for a building that would contribute to the activity and vitality of the area. Thus, spacious retail accommodations and a transparent ground plane were primary design goals. Attendees tour the interior of One Bloor East. 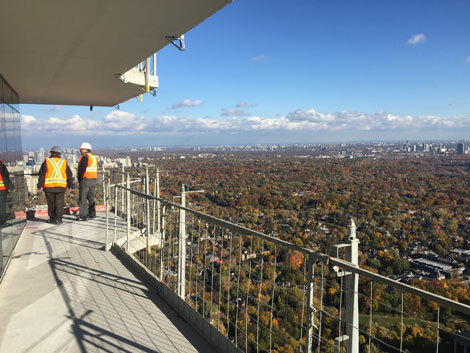 The view during the One Bloor East tour. Next, delegates took a jaunt through Yorkville, walking west on Bloor Street and passing various architectural marvels like the Royal Ontario Museum, which dates back to the early 20th century and received a protuberant facelift by Daniel Libeskind in 2007. 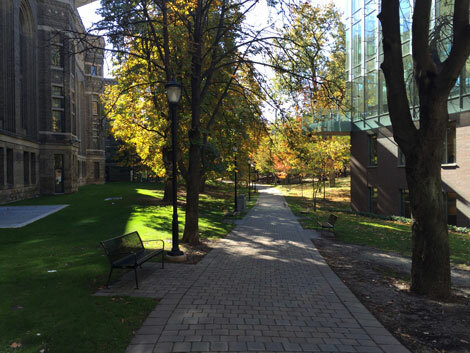 Taking a turn to the south, the pedestrian path known as Philosopher’s Walk provided convenient access to the University of Toronto campus. As they navigated a series of green spaces and interlocking courtyards, delegates were impressed to learn about the campus’s long history and appreciated the role that the university played in the development of the city and its status as a global nexus for academics and research. Venturing into the Department of Civil Engineering, a presentation was given by Michael Montgomery, Principal, Kinetica, covering the innovative technology that his company has developed in the field of damping. He explained that Viscoelastic Coupling Dampers (VCDs) – which transfer vibrational energy into heat – could replace concrete link beams at key locations throughout a tall building, effectively controlling for lateral loads without requiring something as large and cost-intensive as a Tuned Mass Damper (TMD). 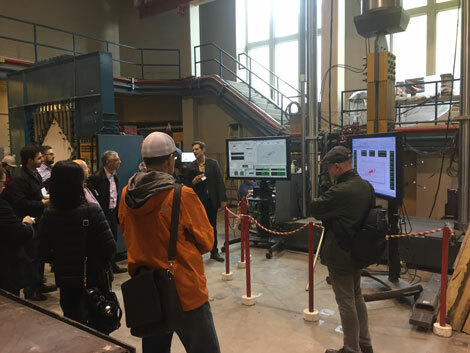 Delegates were then escorted to the University of Toronto Structures Lab, where they got a first-hand look at a VCD in action. Here, a massive device applied immense amounts of pressure to a VCD, simulating the frequency and motions of an earthquake. A heat camera very clearly illustrated how the damper converted lateral motion into heat. The Philosopher’s Walk at the University of Toronto. The group watches a demonstration of the VCD damper. After a short connection on the subway, the group emerged at Toronto City Hall, where James Parakh, CTBUH Urban Habitat / Urban Design Committee Chair and Urban Designer Manager for the City of Toronto Planning Department, introduced his place of work. After having lunch in the modernist building, delegates took a group photo in front of the colorful “Toronto” sign located in Nathan Philips Square, which stood as a vestige from when the city hosted the Pan Am and Parapan Am Games earlier in the year. 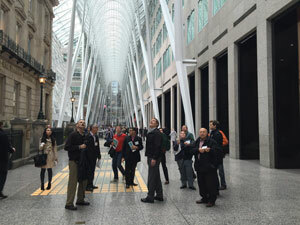 Attendees are mesmerized by the galleria at Brookfield Place. From there, the group descended into the PATH system, an underground walkway linking 30 kilometers of shopping, services, and entertainment. This system provides pedestrians with a climate-controlled environment through which social and commercial activity can take place even during the cold of winter. Bustling crowds, spacious corridors, and busy retail establishments: all signs that this public amenity has been fully embraced and exploited by the city and its inhabitants. In fact, major developments in the central business district are required to provide linkages to this network, as it has become a truly indispensable urban asset. Parakh informed delegates that each section of the PATH is owned and managed by the landowner. Thus, the interior design changes frequently as one passes under various developments, with material palettes often matching that of the building above. Among the numerous stops on this journey, perhaps the most noteworthy was the Allen Lambert Galleria at Brookfield Place, designed by Santiago Calatrava. Jaws dropped as the group emerged into this stunning atrium – a bright, luminous chamber, the frame of which is supported by eight freestanding steel supports. Peter Kofman, President, Projectcore, discusses Mervish + Gehry models. 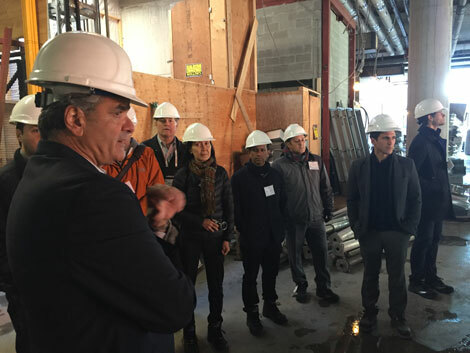 During this bout of urban exploration, the tour group received a gracious invite by Peter Kofman, President, Projectcore, to visit the model showroom for Mervish+Gehry, a highly publicized two-tower development proposed along King Street West and designed by Frank Gehry. Kofman chronicled the history of the project, showing numerous models that Frank Gehry created when he was designing the building. The intensity of the project, which originally started as a three-tower proposal, sparked an extensive public process that ultimately ending with the project being scaled back slightly in terms of mass and height. Now that the complex has received tentative approval, the developer is working on securing financing so that the project can break ground. Next, the group visited perhaps the most recognizable structure on the Toronto skyline, CN Tower. This 553-meter telecommunications and observation tower was constructed in 1973, becoming the world’s tallest self-supported structure and holding the title until 2010, when the 828-meter Burj Khalifa was completed in Dubai. 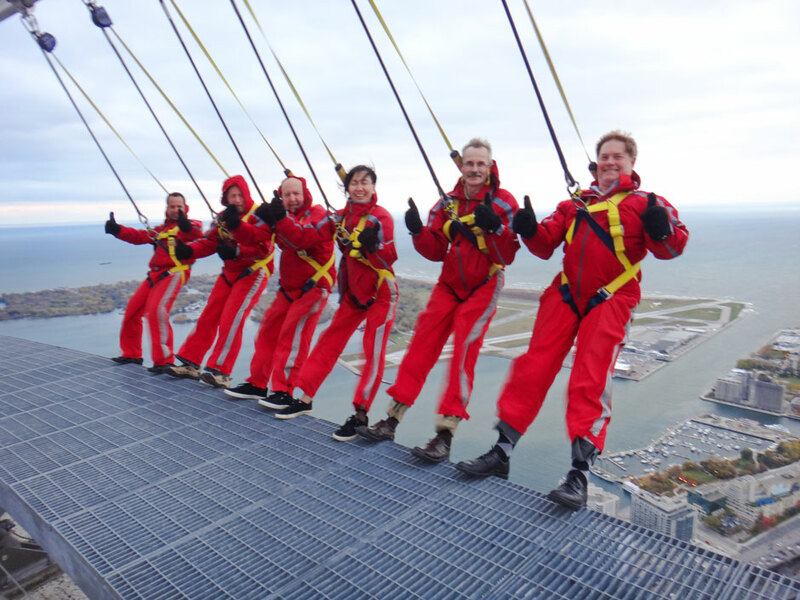 Here, six of the bravest delegates opted to participate in the CN Tower Edgewalk. This attraction allows visitors to walk along the outer edge of the main observatory: no railings, no enclosures, just a harness and a jumpsuit. This was an unforgettable experience for participants, and allowed for some of the trip’s best “Kodak moments.” Afterward, the group treated themselves to dinner atop CN Tower in the famous revolving restaurant, 360. The Council would like to extend its thanks to Lisa Tompkins and Andre Saker with CN Tower, who were very accommodating and generous during the visit. Attendees brave the Edge Walk at the CN Tower. The next day, delegates boarded a bus and journeyed to the neighboring city of Mississauga to see Absolute Towers, winners of the CTBUH 2012 Best Tall Building Americas award. These curvaceous residential high-rises are the tallest in the city and have served to reinforce a local tradition in provocative architecture. Sergio Vacilotto of Dominus Construction led the group through Building E, the tallest of the pair. Stops on the tour included the ornate lobby, a sky lounge, the top-floor penthouse, mechanical spaces, and the rooftop. The final stop on the journey was none other than RWDI Guelph, the headquarters of the world’s foremost wind consulting engineering firm. Delegates were treated to a catered lunch, during which several senior members of RWDI staff presented on some of the biggest feats in wind engineering to date. Anton Davies, Co-Founder, RWDI, proceeded to lead the group on a tour of the laboratories. 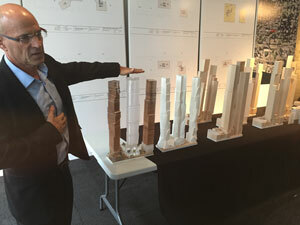 Within the extensive facility, there were wind models on display for almost every major skyscraper project in recent memory. Delegates even had the pleasure of seeing several wind tunnel tests in action and were introduced to the teams responsible for fabricating the models and embedding them with hundreds of sensors. The bus trip back to the city was full of discussion on the lessons learned during this highly successful CTBUH Regional Tour. Back at the Delta Hotel, the tour organizers at CTBUH Canada thanked everyone for attending and hoped that this would be just one of many visits back to the high-flying city of Toronto. The group poses for a photo at Absolute Towers.